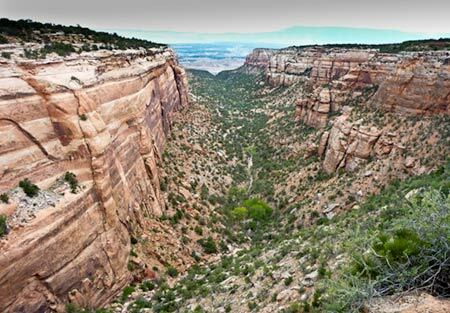 The Colorado National Monument is 32 square miles of beautiful western scenary located between Grand Junction and Fruita Colorado. 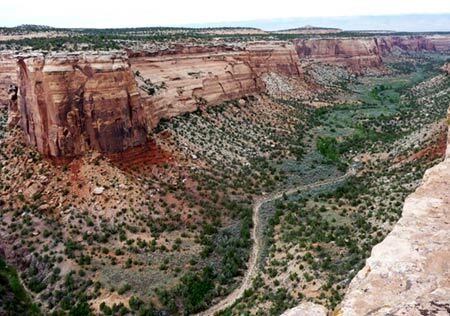 Whereas the landscape at the Black Canyon of the Gunnison was created by the action of the Gunnison River, the landscape at Colorado National Monument was created by erosion of red rock by wind, rain, flash flood, and freezing and thawing over millions of years. 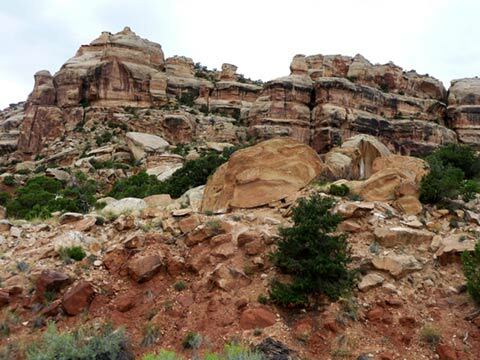 This is the process that created much of the landscape we were head towards in Utah. 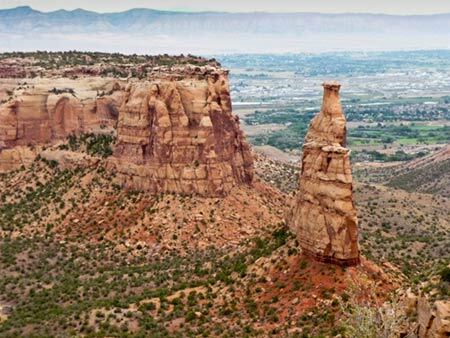 The Colorado National Monument is full of steep canyons and red rock spires. 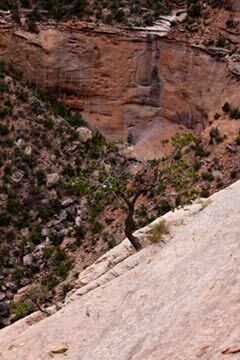 The canyons here are short and were created by flash floods not the constant action of a river. This is part of the Upper Sonoran desert. It receives less than 10 inches of precipitation a year. Much of which comes as thunderstorms or other storms that can drop over an inch of rain in a short time. 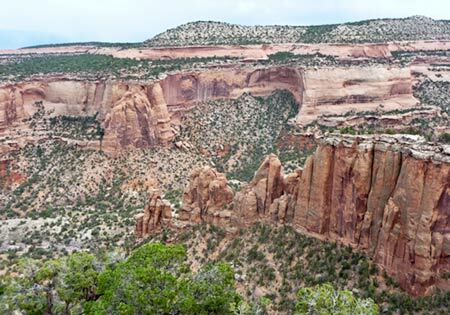 We got to the Colorado National Monument too late to visit the visitor center-- something for next time. A storm was brewing all the time we were there and it hit at night after we checked into our motel. 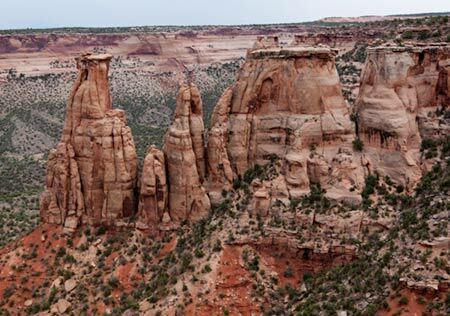 The landscape here in Colorado National Monument provides a brief preview of the landscape in many of the Utah National Parks and monuments. They are formed by the same forces of nature--wind, rain, freezing and thawing, and flash floods. These forces produce landscapes of great beauty. 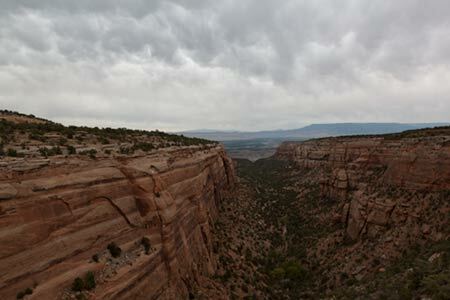 When we got to Utah, we learned that the storm system that produced the storm in Colorado National Monument, had brought flash flooding to Canyonlands. Travels with Nessie Home :: Site Map:: Contact webmaster@ncsparks.com-email us:: Copyright Leslie Sparks 2006, 2007, 2008, 2009, 2010, 2011, 2012,2013,2019:: Last modified: April 23 2011.